You know how people of a certain region often think they’re the only ones who know what real [insert food of choice] tastes like, how it should be prepared, how it should be served? I totally hate those kinds of people. While, certainly, there is truth to specific ingredients, generations of people and ethnicities, and the water, all being located more in one region of the country than another, and this does factor into availability and, sometimes, quality, a lot of it is posturing. Plus, to say that there’s “no good Vietnamese food here,” for example, brings into question the notion of authenticity and who really decides what “good” or “real” Vietnamese food is anyway? One thing I know for sure: it’s not me. So, when people lament there being no “good” Mexican food in Minneapolis or question how, in a place so cold and so geographically far from Mexico, could you have possibly had some of the tastiest tacos you’ve had in your life, you just shrug. ‘Cause hipster foodies and close-minded fools aren’t going to get it. And, really, let’s not be heroes and convince anyone otherwise because, well, it means more tacos for those of us who believe in the hidden gems and the strip mall finds. It means we’ll always have the best date spot to woo our sweethearts, best friends, and other VIPs in our lives. Win, win! 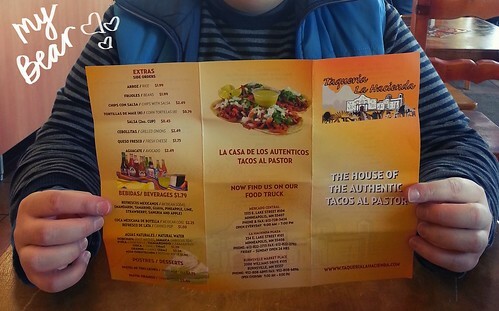 I had heard whisperings here and there about Taqueria La Hacienda, but had never made it to any of their three Twin Cities locations until two weeks ago. Bear and I had to go out to the suburbs to run some errands when I was reminded of their Burnsville location and knew it was our to-be lunch spot for the day. We’re big fans of Mexican food, but seem to rarely have it and I knew going into this that if Taqueria La Hacienda was good, I was going to have a problem on my hands. Can I tell you how we ate our four tacos each, considered getting more, left, and then proceeded to discuss throughout the rest of the day if we should go back and get take out for dinner? Would that be embarrassing? Did we care? Should we go to the location on Lake Street closer to home where we hadn’t already eaten that day? Ultimately, self-control won out, but that doesn’t mean we haven’t talked about the carnitas and the al pastor (bbq pork) tacos at least twice a day since. 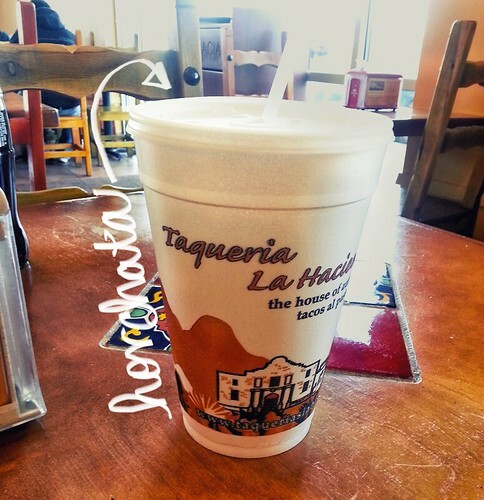 It doesn’t mean I haven’t actually dreamt about the horchata. 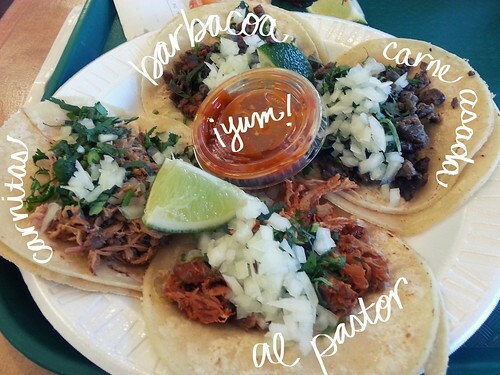 It took us a while to decide what we wanted to have, but sampling the different tacos seemed the best way to jump in, so we ordered two of each – carnitas, al pastor, barbacoa, and carne asada. I made Bear try them one-by-one with me, even waiting to take first bites at the same time, and give each other the play-by-plays. Everything was tasty and fresh, but the clear winners were the carnitas and the al pastor. They were both super flavorful, tender, salty, everything you’d want. The simple serving on corn tortillas with the tiniest, most perfectly diced white onions and fresh cilantro were all either meat needed, save for maybe a drizzle of their spicy salsa. I liked the barbacoa quite a bit too, but I once over-cloved barbacoa when I was making it at home and Bear’s sense of taste has never forgiven me for it. The carne asada was char-broiled and especially great with the salsa, but didn’t stand up to the carnitas and al pastor. I can’t wait to go back and try the chorizo taco and, maybe even the lengua. The tacos were a mere $1.85 a piece, but since the al pastor tacos were the special of the month, they were only a $1! I mean, just typing all of this makes me wonder why we’re not there right now. Oh, Beeeeaaaarrrr….